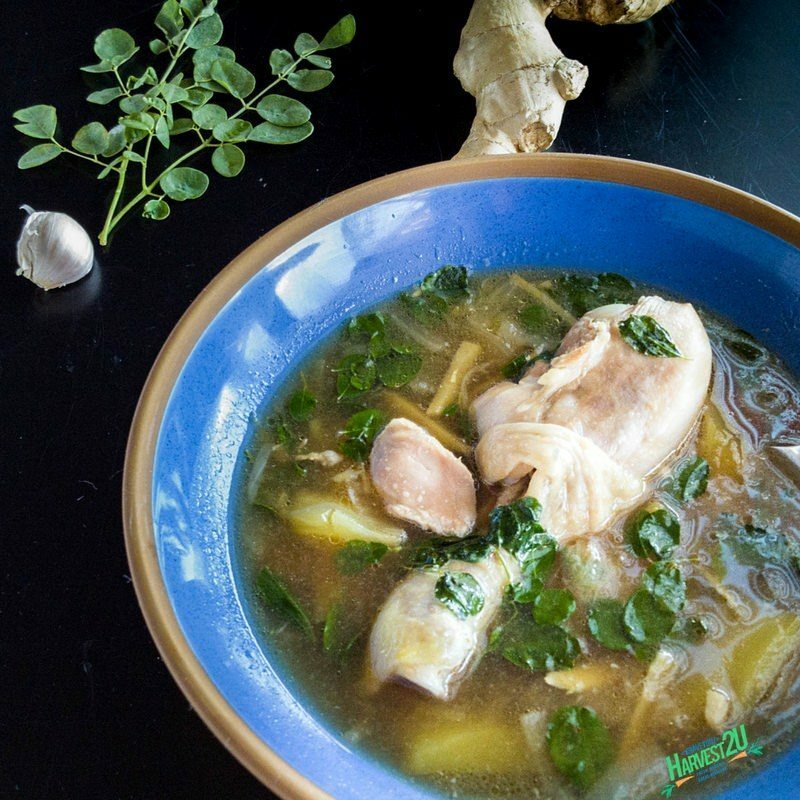 Chicken Tinola is a quick and easy soup to prepare. Its a staple of Filipino cuisine with plenty of regional variations. Moringa, called Malunggay in the Philippines, is a nutritional powerhouse with antioxidants, proteins and plenty of vitamins. Moringa leaves also has two times the amount of protein as yogurt, three times amount of potassium as bananas and four times amount of calcium as milk. Combined with the garlic, ginger, and chicken this is one healthy meal. You can find the fish sauce in the Asian food aisle. If you cannot find a green, under-ripe, papaya, you can also use a chayote squash or even zucchini or other summer squashes. Heat olive oil over medium heat and saute garlic, ginger, and onions until onions begin to turn translucent. Brown the chicken pieces on all sides. Add fish sauce, chicken broth, and papaya. Bring to a boil then simmer until chicken is completely cooked, about 20 minutes. Add moringa leaves and simmer for 3-5 minutes until tender. Do you provide nutritional information for your recipes, e.g., servings, calories per servings, fats, carbs, sugars, vitamin content? Do the moringa leaves have woody stems that have to be removed? Can they be eaten raw? What do they taste like? How do you have local grapes that are ready now? I have grapevines in my backyard and they are bare except for a few brown leaves now. What if I never want oranges? (I have citrus trees in my yard). How long does the family box last a family of 4. Does the produce spoil faster than supermarket produce? I have food growing in my yard, so I would only want to buy boxes when my own crops are not ready. Is that an option? No, we do not provide nutritional info with our recipes. The goal with our Harvest2U recipes is to show our customers what they can do with the local and fresh produce they get in their boxes. Moringa leaves do have a main stem, but removing the leaves is easy. To us, they taste like those vegetables in the brassica family. We do not have grapes at the time. You’re correct they are out of season right now. You can give a “Can’t stand” list to us. Those are fruits and vegetables you do not want. Our fruits and vegetable only spoil if left out of the refrig too long or not stored properly. Much of the Grocery store produce is GMO or modern hybrids that are bred for shipping (not taste) and will last longer on a counter than local organic produce. It’s a little scary how long they last too. To your last questions. The family box is filled with 13 items. If you’re great at food prep and utilizing in cooking I’d say a week with a family of four. Our boxes, once subscribed to, can be placed on hold anytime.